Hooray... it's not even Dec 1 and my house is decorated and CLEAN! It's a big deal for me.. Shhh.. no one breathe or dirty a dish!.... It's so great to wake up to those Christmas tree lights and have some morning coffee, isn't it?! 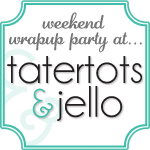 Here are two "whimsical" projects we completed this past weekend that I am super excited about! I say "we" because my talented husband cut up the last of that pallet wood I had. plus some scraps into a Christmas tree! 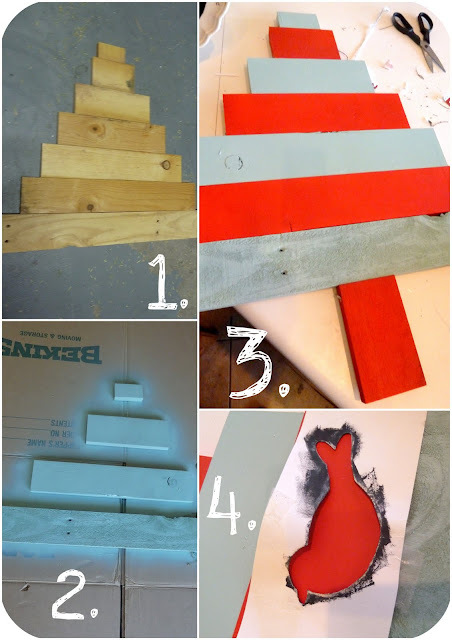 First, he made those cuts for me and I spray painted aqua and red colors. After those were dry he used screws to nail the wood pieces all together. I stencils two white love birds and that was it. Bright, simple and cheery....love it! My wreath took all of 10 minutes! My entry way is so festive now!! 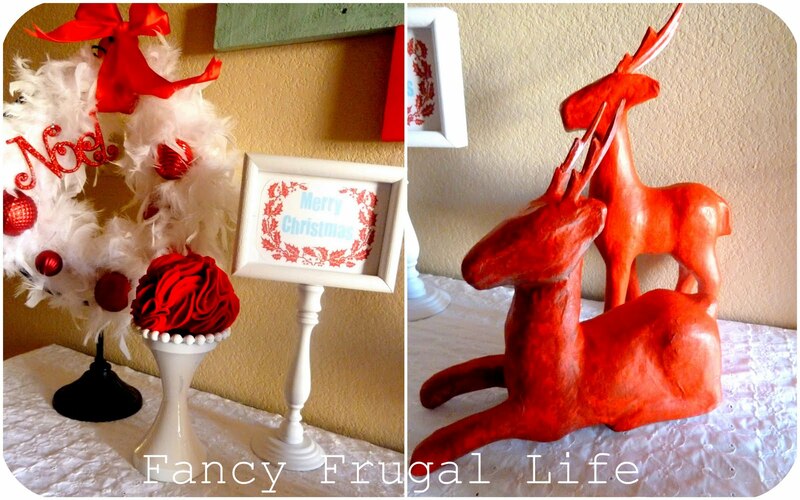 I threw in one of my handmade pedestal frames and sprayed these two deer (from Michael's). They were silver from a few years back. 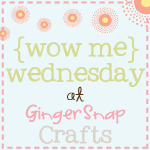 Hi, Stopping by via Tip Me Tuesday, and I LOVE IT ALL! The colors, the simplicity, the birds - love it! Wow! Fantastic! I really love the fresh color combos, and that pallet tree is so, so fun! Stopping by from Tip Me Tuesday, and I'm your newest follower. Would love for you to stop by my place for a visit! You're way ahead of me on the decorating. I don't think I'll have time until after my last craft show for the year this coming weekend. Love that pallet tree and the boa wreath. Very clever! FABulous! I'm loving that pallet tree! Would you consider sharing it here? Your wreath is also very pretty and I love the price! Love the pallet tree. Aqua and red is one of my favorite color combos these days. Great job! 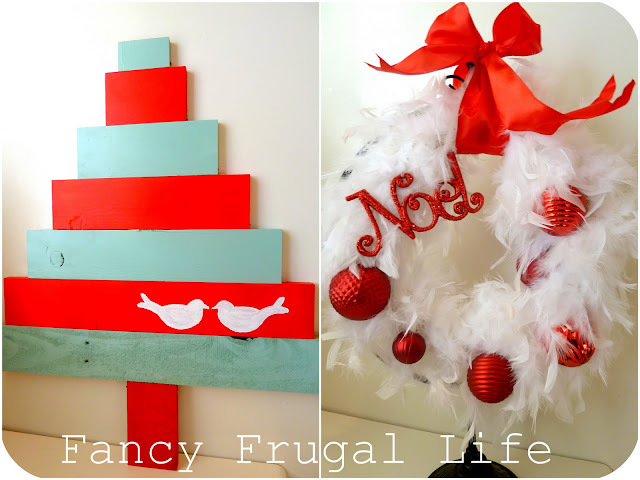 I love that your pallet tree and wreath are both Whimsical and beautiful! Super cute wreath. I love the pallet tree also. 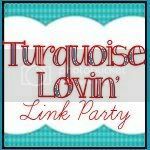 Stopping by from Savvy Southern Styles linky party. LOVE THE TREE! Really I DO LOVE THE TREE! 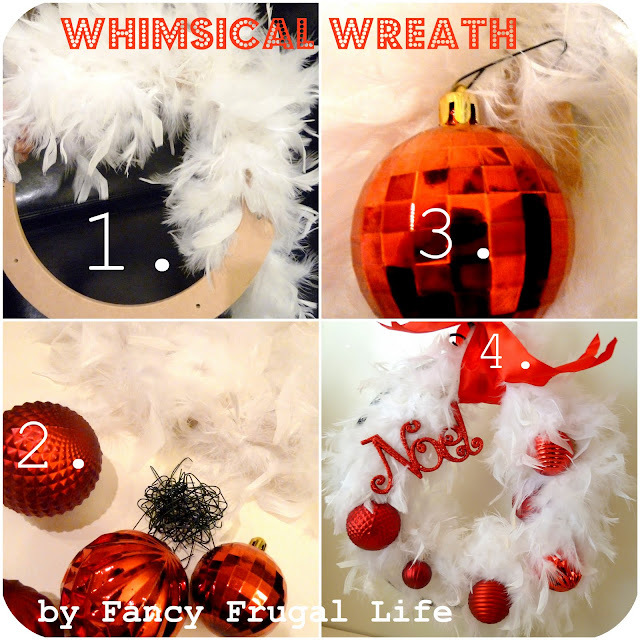 Fabulous ideas, I'm all in to the boa wreath! Cute idea! And the pallet is wonderfully festive! Lina my friend you are getting a sticker AGAIN! You should have a STICKER BOOK. See you tomorrow during STICKER TIME! I absolutely LOVE the wood tree with the birds! It is adorable!! I'm your newest follower from the at the picket fence party. 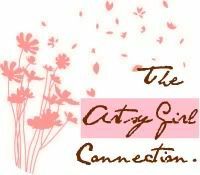 If you get a chance, I'd love you to stop by & maybe follow along too. I love it! ;) wow.. I really love the palette tree!!! I would love to try it out! I love the colors in your pallet tree! It is so graphic and simple! I love the pallet tree!!! Great colors! The tree is so cute; I'm in love with it! I also love the frame pedestal. What a cute idea! Our Christmas train of thought seems to be on the same course. I am also using red, aqua and white this year... I was planning to make a wreath using white feathers tomorrow and I just finished my wood scrap tree the other day and will be blogging it tomorrow. My tree is pretty different from yours... but same idea nonetheless. Clearly you are as brilliantly crafty as me. Great work! Love your whimsical projects! Such a fun idea!! I love the colors that you sued too!! I love them both. Live the colors you chose for the pallet tree and the feather wreath is gorgeous!!! I think I may try to make one!! Thanks for the inspiration!! Great, great, great! Thanks for sharing, you are a talented designer! I LOVE the Christmas tree!!! It's looks a-m-a-z-i-n-g!! Visiting from Thrifty Decor Chic. So cute and I just love that color combination. Love them both!! so cute! Thanks for sharing at our Special Christmas Soiree! I love this sweet tree and especially the colors you used! 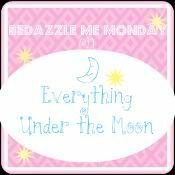 I featured your tree on this week's Terrific Under Ten Tuesday! I love this colour scheme and the pallet tree is just adorable! I'm a sucker for anything made with a feather boa.....instant gratification! White feathers + red balls (ha!) = awesomest wreath ever. LOVE. Pick Your Plum Giveaway Winner!! !